» Boric Acid for Roaches ~ In Home Solutions! Before we delve into boric acid as a roach killer, you may be wondering how roaches got into your home in the first place. Most common sources may be grocery bags, laundry or they wandered into your home from the neighbors. Once they establish your home as a good habitation, you have an impending problem. This is because they are capable of reproducing thousands of offspring in a year. Even if you manage to kill the females, the eggs hatch by themselves. Second to house dust, roaches have been found to be one other huge source of allergy. They are known to transmit bacteria and possibly cause food poisoning. Warmth and plenty of food enable cockroaches to thrive well. Therefore, it is important to practice sanitation in and around your home. This is not to say, however, that they cannot exist in your home because it is supposedly clean. Dark places, cracks, and crevices, garbage cans, etc., are other environments that you are likely to find roaches. So how do you fight them off once and for all? Most people go for pesticides, and with time, the cockroaches are likely to be immune to them. Also, pesticides are not only harmful to roaches, but also to you, children, pets and the entire family. Baits, on the other hand, may not prove as competent as recent reports show that roaches have mastered the art of avoiding these commercial baits. Did you know? : Some laundry detergent and household cleaners contain boric acid? Where to Apply Boric Acid? Having been around for 60 years, boric acid has proven to be one of the most effective agents used to combat roaches and other pests. It may also go by the names; boracic acid, hydrogen borate, acidium boricum and orthoboric acid. This white inorganic product is derived from a mixture of boron and water. Boron is a common ingredient in some household products like toothpaste, mouthwash, and laundry solutions. It can also be produced from naturally mined borax and is known to get rid of small insects and pests in homes, restaurants or buildings. The best thing about this product is that it is deadly to roaches but low in toxicity when it comes to people and pets. People can touch it but it should not be ingested. It has no repelling effect on the roaches which is one quality that makes it quite efficient. Boric acid is readily available in grocery stores, natural food stores, home improvement, and hardware stores. It is mostly packaged in bottles similar to the squeezable ketchup plastic bottles. You don’t need to dilute or mix it. It contains no volatile solvents and has no smell. Did you know? : Although boric acid kills roaches it is basically non-toxic to birds, frogs, fish, and bees? Unfortunately, most people use it incorrectly which interferes with the expected outcome and result. Proper application should involve a very thin layer that is barely visible. If you pile it up, the cockroaches are bound to go around it as they will view it as a barrier. Although it is harmless to humans, a pair of cleaning or latex gloves is recommended. Before application, shake the container and puff a very light dusting into the area you wish. This is better enabled by a container which is no more than two-thirds full. Most of the bottles have blocked nozzles at the top. You should only cut a small area to help you achieve the light dusting. Avoid layering the powder in visible piles. While holding the cut nozzle with your finger, give the container a few shakes. Next, tap its bottom to allow the excess powder to settle. Now you can squeeze out some powder to the surface you are targeting. For cracks, crevices or other inaccessible areas, you can opt to use bellowsfor better reach in those areas. To prevent the powder from caking, some pebbles or coins inside the container will do. • ALWAYS read the instructions before use. • NEVER apply the material with a spoon. • NEVER apply the material on countertops or surfaces used for food preparation. Did you know? : Boric acid for roaches has been popular since the early 1900’s. There are different ways through which boric acid kills cockroaches. Note that the nature of boric acid is that it is both a mineral and crystalline. The first method is through ingestion. When roaches step on the substance, they will try to clean off the powder from their bodies and legs by ingesting it. Cockroaches harbor pathogens but ironically, like to keep themselves clean. The crystallized acid will rip the roaches’ exoskeleton which eventually kills the cockroach. If the crystals don’t kill the cockroach, they will suffer from extreme thirst causing them to be dehydrated and die. Surprisingly, roaches eat their fellow dead roaches. If a roach died from a substantive amount of the acid, the roaches that consume it might die thereafter. If you find the eggs lying around somewhere, the best way to get rid of them is to crush them with your feet; of course with shoes on. Roaches will die within 72 hours after they get in contact with the powder. Juveniles and nymphs succumb to the powder in 24 to 48 hours. Most people become discouraged when they see them walking around after being in touch with the powder. In fact, before they die, they may exhibit strange behavior like coming out in areas with plenty of light or walking in the middle of a room. This is as opposed to walking along the wall or edges of a room where they feel most secure. It is only a matter of time. Did you know? : Boric Acid has been used as far back as ancient Greeks! Cockroaches inhabit areas close to food sources. Any place within five feet of water and food is a highly likely place to find them. Always remember to cap your toothpaste as they will eat it. For cracks and crevices, foam fillers, caulk or silicon should be used to seal them off. Glue products are not effective as cockroaches eat glue. • Openings at the point where plumbing pipes enter the wall, e.g., under sinks, behind the washing machine, etc. • The bathroom For optimum results, apply it at night when the roaches come out and leave it overnight. Any residues that find their way on countertops should be wiped off immediately with soap and water. You can also choose to employ a dual control method using boric acid and cockroach baits for efficiency. The safest bet to rid yours from this roach infestation is to first ensure that there are no foods or food particles left lying around; on the floor, table, dirty dishes in the sink, etc. Make sure there is no standing water left anywhere in the house such as your bathroom or kitchen; roaches love moisture. Lastly, use boric acid powder in their most likely habitations or areas you have spotted them in. This way, it’s only a matter of time before you get rid of these unwanted guests. 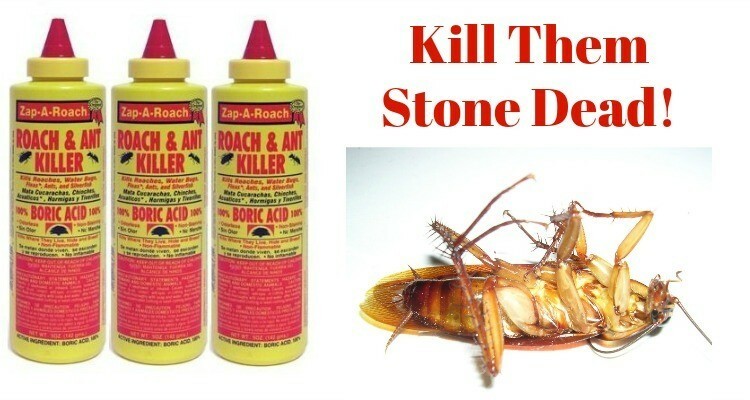 The video below tells the best way to use boric acid for roaches.